I highly recommend this book if you teach piano or are a piano student who is serious about learning how to play. Gretchen and I were colleagues in college. She is a dedicated, thoughtful musician. 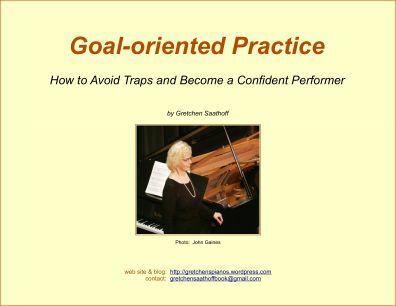 Her book describes how to practice piano in a clear, concise, & organized fashion. In all my years of playing, nobody …taught me how to practice. Gretchen’s concepts are easy (but why didn’t I ever think of them when I was a student wasting hours in the practice room?). Many of Gretchen’s suggestions can be applied to life in general, as well. Check it out! Please recommend this to anyone whom you think might be interested. It should be THE manual for how to practice piano.